I have been meaning to write this for ages because every time I wear this backpack in public I get at least one stranger ask me about it. Niamh will still sit in the stroller happily sometimes, she prefers the backpack, probably because instead of the back of people knees or the fences at the zoo she sees the world at the level of 5’4 or even 5’10 if Lars wears it. I first saw it on a blog I read and she said her son loved it so much his first word was ‘backpack’. Niamh most definitely and clearly says backpack and knows what she wants when she says it. A few times over the winter she has seen it in the closet and clung to it with tantrum like kicking and screaming until we bundled up and went outside in the backpack. I have walked around and around the block in the dark (5pm) like a crazy person because of the backpack but it does make her happy. Sundry describes the features of the backpack really well, I have a slightly different model but it fits a good amount of stuff and when it is closed it just looks like a normal backpack. Mom pointed out that I have been traveling for basically an entire month. I left for NY on Dec 24 and I returned from Fl on Jan 26 and did not have more then 8 days in MN in-between. No wonder the pile of mail is outrageous, my blog is neglected, and I have a $16 library fine. Oh well, no travel for a little while at least. Next planned travel extravaganza (because they always get piled on top of each other) will be visiting NY for Miss Math’s wedding in late March (close to 8m pregnant) and then on April 10th a road trip to the other side of WI for a big event and then Lars’s mom is visiting the following weekend. A month after that there should be the small matter of a trip to a hospital to produce a new baby! I know my blog pre Niamh was all about being pregnant and it is certainly on my mind now but there are just so many other things happening too. 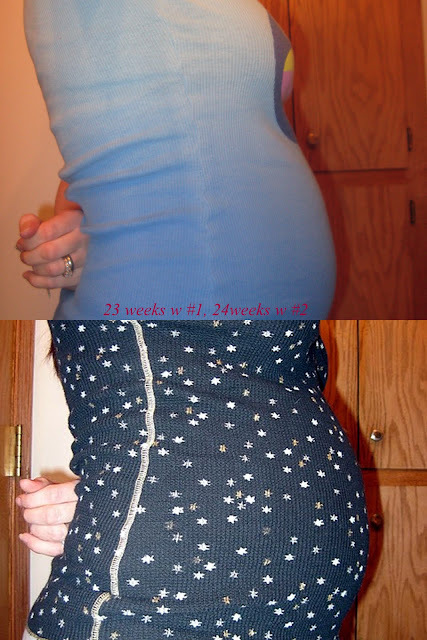 I just took my 24w pic tonight, I did 23w last time but I can’t turn back time and take the picture yesterday so I figured it was better to label correctly rather then go for consistent labels on the two picture timelines. So here is the 1 (bottom) v 2 (top) comparison and I think I’m still right on track. Who said the second time you look bigger? So far this pregnancy has been pretty similar. There were some really different symptoms in the beginning but they actually stopped and now I’m pretty much the same as last time. Biggest complaint is heartburn, no real swelling or pains. I sleep fine and don’t need to get up at random times. People are definitely noticing I’m pregnant now, being away so much I think made it more obvious. I don’t have any cravings but I have the need to eat more often so I’m back to the honey nut cheerio snack like last time but this time I have to share with Niamh. Niamh is noticing the bump, she may know there is a baby in there but I’m not sure. She is a smart cookie and is really beginning to remember and recall things way after I think she has forgotten. Most impressive from the past few weeks is she seems to be getting a concept of time. We told her we were going on the airplane in the morning right after she woke up and the next morning the first thing she said was ‘airplaine!’. At the end of the FL trip I was calming her down by talking about all the things we did that day (including packing) and what we were going to do the next day and before I got there she said ‘go home, airplaine’ because I mentioned earlier in the day we were packing to go home tomorrow. Her speech is getting more and more clear, she often says 2 or 3 word sentences and her grammar isn’t all that bad. Lots of her phrases are like ‘Momma sit here’ or ‘we go car’. She is still using sign and made up her own for music – she kinda dance/shrugs and that is a silent request for you to turn on some music. Potty training was in a pause while we were in FL but she is back in full swing and daycare reported she pooped in the potty today. I’m ever hopeful that she will be done with diapers before new baby is born but if not, she atleast uses way less then she used to. She also gets them herself and brings them to you so thats handy. Her little pre-2 self is getting self righteous and opinionated, other then telling people where to sit she has whims about food and what she will or will not wear/not take off. Since Lars is in charge of dressing her on weekdays more then once an item worn to bed appears to still be on when I pick her up from daycare. Today were here ‘grandma’ socks (the purple ones that match mine that mom made for TJ) but I doubt her socks get very dirty while she is sleeping. Speaking of sleeping, she is getting good at staying asleep from 7pm to 7am. She has night terrors sometimes and that is freaky and sometimes she wakes up and spits out all the buzz words she knows; ‘potty!’ ‘scared!’ ‘water!’ ‘hungry!’ ‘my nuk!’ all punctuated by screaming. She usually is thirsty, sometimes she can squeeze out a drop of pee and often her nuk is missing but mostly I think she is looking for confirmation we are still there. This tends to happen at 1am, if we make it past then she is usually good. On the very positive side she goes to sleep with a very minimum of fuss, often none, and is asleep within 10min if not sooner. Notable exceptions of course are when we travel, then most bets are off but still she is reasonably good. I did learn that she can’t be trusted in a not crib bed since she woke up in FL and was very upset and I cuddled her on the daybed next to the pack-n-play and left her sleeping there since I think the soft bed was way more comfortable for her but about an hour later there was a little face at the end of our bed…. We need to transition to toddler bed soon so we have the crib for the baby but I think the baby gate will be on her door and she will be in a very child proofed room. I’ll do some trip details tomorrow or later, we took 1000 pictures but I can’t upload right now because of the game Lars is playing. Amazing, a whole 3 days in one country! I just got a call from my MiL who we are visiting this weekend. I feel a little traveled out but visiting them is not work, and, Lars and Niamh will be with me rather then leaving anyone at home. That makes a world of difference. Niamh won’t know what do without snow but I’m sure playing outside will come back to her. Not that FL is exactly tropical in January but it is not freezing either. We also got good deals on tickets so it is double nice to visit warm weather for a good price. I need to get my brain in gear to pack, it won’t be too hard just needs doing. The laundry we started is still in process… I had a really bad stomach ache today – constant nausea. I don’t know if it is a sickness caught in some random country or airplane, bad eating yesterday, or jetlag. Whatever it is having a little internal future golden gloves winner is not helping! I left work an hour early because the supplier that was supposed to be there forgot, and, I had been only holding it together by a thread. Things are feeling a little better and now I’m going to go eat an egg and toast for dinner. Finally arrived back in the US yesterday morning after a long but dull trip. There was an Indian family that had the other 3 seats in my row and they wanted me to trade for their middle seat in the row behind and I said no way, I want my aisle. I think the mom secretly thanked me because she got 24 kid free hours. They were not badly behaved boys but they were a little annoying to me and really picked at their dad so the mom was on a minivacation. Malaysia was probably my favorite country but it had the worst internet so I got behind on my work e-mail and no time for uploading pictures or blog updates. Each country on my trip had its ‘best’ feature, well above the others but if the internet would have worked Malaysia would have been the clear winner. Korea was blah but had the best bathroom and coffee (not related). Vietnam had hideous traffic and crossing the street was like playing frogger but their weather was the best (80’s and sunny) and so where their towels and bathrobe. A neurotic part of me has a mental chart going that maybe I’ll put on paper someday comparing the three hotels and countries. Lars and Niamh ‘met’ me at the airport. I was imagining seeing them as I exited the international section but I got out and they were nowhere around. I did spot them way down the terminal walking away from me so I had to run after them and catch up. One good point to a neon green coat is it is easy to see and unique, I can see Niamh a mile away. I got to them and Niamh gave me an uneasy look and then dove for me. I soon noticed she was wearing no shoes…. in the excitement to go ‘get mommy’ there was no time to put on shoes. I guess when you are under 2 you can get away with that. Lars said she was fairly calm about me being gone with the explanation that “mommy’s in Asia” but as soon as it was “we are going to get mommy today” it was apparently time to go immediately. The rest of Saturday was groggy but nice. I tried hard to stay up but it didn’t happen. There was the feeling of bliss when I lay down on my own soft flat bed that I just could not leave. I was dizzy from being awake more then 24 hours. I moved to the livingroom so Niamh could play on me and that was a fair compromise in her mind. Sunday we got back in the swing of things and a friend came over to visit and watch football. Not that we normally watch football but it was a good background to the day. I uploaded a selection of my Asia trip to flickr. I only took 42 pictures worth publishing while in 3 countries, without my favorite subject there is less motivation to photograph the world. There are only so many trees and flowers I think people want to look at. Feeding the Malaysian monkeys was fun, they enjoyed the granola. I did not personally feed the Korean seagulls but they were eating out of peoples hands. There were no Vietnam animals that I could see other then a gross beetle in the airport (not pictured but I didn’t kill it either). I read two books while traveling and I’m starting a 100 books tab with mini reviews – both were fiction both were good. There were two major happenings while I was away, one friend had her first baby and he is HUGE, almost 10lb but long. I don’t have the birth details but given the operating room setting and his perfectly shaped head I believe he came by c-section. The baby was more or less expected, so, the other news that Miss Math got engaged was much more of a surprise! She is excited and has been convinced that she needs to at least invite a few people and go to a restaurant but her long standing wish has been for SMALL wedding so this will be teeny but no less important. This coming week is short again, we are going to Lars’s mom’s for a long weekend. After that I’m ready to be a hermit for a while… I feel like I have not been home in a month and in some ways I haven’t really. I dreaded leaving Niamh for a week but it was not all that bad. She accepted I left and accepted me back with little problems. It feels cold but I just put her out of my mind for the trip, I would have been a mess if I thought about what she was doing or needing at any given time. I showed people who asked our christmas picture montage, people really only ask to be polite and I didn’t want to bore them with a bunch of pictures. Other then that I just focused on working and getting from place to place. An unexpected bonus of the trip was some bonding time with the bump. New baby swished and kicked and kept me company in a way and it was nice to be able to just focus on the internal feelings when I had time alone in the hotel or airport – no laundry or housework or anything to distract. So now I’m back, pictures are up, laundry is in process and I’m ready to get back to regular life for a few days. Anything else happen while I was gone? Part I of this trip is almost complete, I leave Korea tomorrow morning at 8am. Right now I’m having paranoia about the person who is supposed to bring me to the airport forgetting but I hope that if that happens I can get a taxi quickly. I fly from Busan to Narita Japan then a one hour layover and then from Japan to Malaysia to arrive 6pm local time. I’ll be traveling for about 12h if you include getting to the airport. I’m looking forward to going to Malaysia because it is warm there. Korea is hovering around freezing and while that is way warmer then MN it still is freezing. I brought a fleece jacket and a good scarf but I didn’t want to overdo it since the majority of my trip is tropical. I did ok on Sunday since we mostly were sightseeing (walking or inside) today was more meetings and visiting production facilities that are all unheated. I never took off my jacket… The meetings were productive and while we didn’t finish anything we got a really good start and I think the project will go much better now that we are clear on a few points. I dragged myself out to dinner with everyone tonight and I’m glad I did because it was the best meal yet. It was Korean bar-b-que and it has no bbq sauce at all. There is fresh meat (cow, I checked) grilled on two person skillets on the table and a ton of veggies to eat with it. It was like meat and veggie burritos ~ The meat was tender and thankfully unspiced/saused/gacked because the burgers at lunch were slathered in some odd brown gack that made me queasy until dinner. I’m not sure if it was the sauce or the fact I didn’t eat a lot of lunch but dinner made me feel 100% better. people run very oddly, they keep their arms down and swing their hands across the front of their body instead of pumping your arms like I’m used to. On the very positive side there seem to be no shortage of ‘western’ toilets. So that is Korea in a nutshell or what I got out of 2 days here. Next stop tropical Malaysia! CONFIDENTIAL: The information contained in this email communication is confidential information intended only for the use of the addressee. Unauthorized use, disclosure or copying of this communication is strictly prohibited and may be unlawful. If you have received this communication in error, please notify us immediately by return email and destroy all copies of this communication, including all attachments.